Well the painting table is looking nice and full ! A party of treasure hunters for Frostgrave. 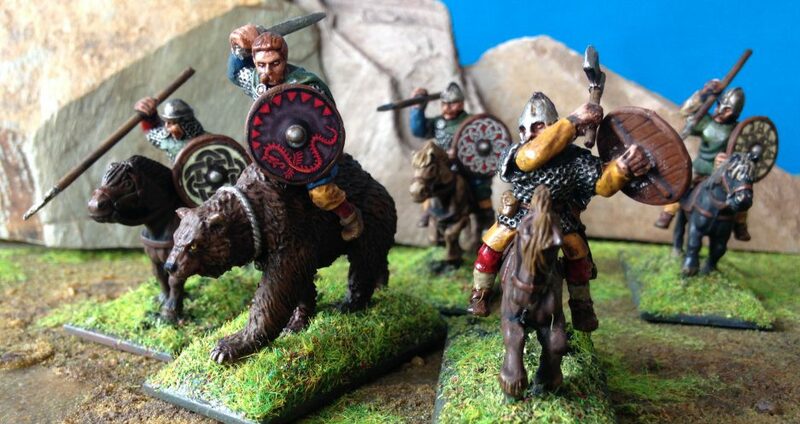 A few extras for my Dark Age Welsh Warband for Saga. The beginnings of my Arthurian War Band for Dragon Rampant. A Norse Seiðr, (sorcerer /shaman). Two sacrificial victims and a ring of standing stones. I haven’t even unpacked The Skraelings yet ! Some Daleks I have been working on. There have been a number of Dr Who stories involving Merlin and I am definitely intending to devise a scenario like this in a future game possibly of Dragon Rampant. The figures were part of a give away with Dr Who magazine which I was lucky enough to pick up in bulk for 25p a packet second hand. Keen Whovians will notice they are the newer type of Daleks. From the later more modern series of Dr Who of recent years. I have however painted them more like the Daleks I knew and loved from my own childhood. I used the cement ballast blocks out of an old washing machine for the photography background. Looking forward to telling some exciting sagas in his shadow. Should be able to develop some good scenarios. Sacrifice and rescue. Disruption of power. The opening of portals for gods and to other worlds. Agrax Earthshade wash. Still planning to seal and highlight with oils. Base coated in Tamyia TS-3 Dark Yellow # 85003 spray paint. On an M.D.F board base, coated in P.V.A glue and builders Sand. Gate able to open and close using tiny magnets drilled and glued in to the body and hinges. Mixture of flock and stick grass on the base over a coat of Humbrol 160 German Camouflage Red Brown Matt spray paint. Wooden coffee stirrers make the start of a bonfire going to add some more drift wood “logs” . Drilled and glued loads of tiny pieces of wire of varying diameter into the body to give a more ragged finish.